1/2 hog, processed, cut, packaged and frozen. Place a deposit of $250 to reserve a half a hog. We harvest September-December and fill reservations in the order we receive them. We will notify you with an invoice for the remaining balance once we learn the hanging weights and inform you when your hog will be available. You can pickup your hog at the processing facility or we will arrange delivery for a small additional fee. The balance is due at this time. 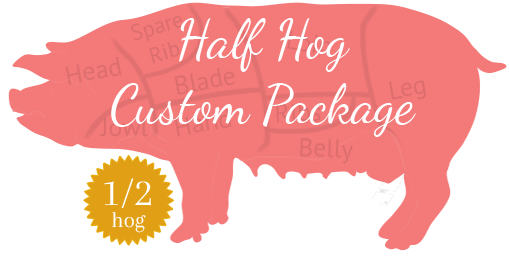 We have carefully crafted our Whole Hog Custom Package with the finest cuts for you to enjoy. Other: Hocks, liver, heart, etc. Please include your phone number if you would like us to give you a call.